The gateway to the Sacred Valley, Amazon adventures, and the starting point for a Machu Picchu visit – Cusco holds its own and warrants a long stay in itself. When I arrived from my long overnight bus from Puno, I only intended to stay a few days on either side of the Salkantay Trek. But I quickly fell in love with the ancient city and ended up staying almost two weeks! Cusco’s central square: Plaza de Armas. Wandering in the San Blas neighborhood. Crepes at Creperia La Bo’M. Christmas time in Mercado Central. Exploring the backstreets by foot. 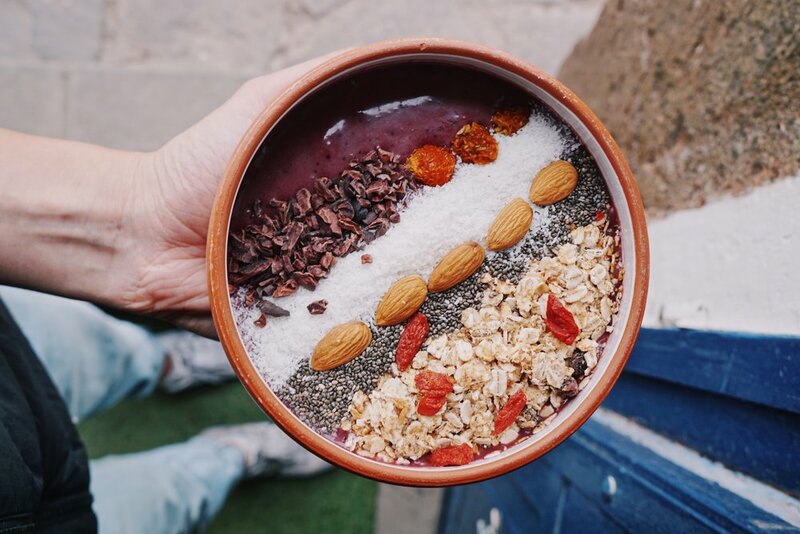 Treat yo’self: Amazing acai bowls at Qura. From a tourist perspective, Cusco has it all: amazing food (both traditional and new), stunning old architecture, plenty of activities, and a good mix of history and mysteries which will have you feeling like you’re in an Indiana Jones movie. I’ve gone through my Cusco highlights reel below. Enjoy, and make sure you shoot us a comment if you end up visiting any on your trip! 1. How many days do you need in Cusco? 7. Visiting Rainbow Mountain - Is it worth it? how many days do you need in cusco? Cusco is one of those places where you can spend a little or a lot of time, depending on your needs. I stayed a total of nine days across two weeks, with the Salkantay Trek in the middle to break it up. I felt this was a good amount of time to see everything and truly enjoy the city and its vibe. The best views in Cusco: Sunset at Limbus Resto Bar. July and August (peak season): These are the driest months of the year, with less chance of rain. The downside: it’s high season, so accommodation prices will be at their highest and the city will be very crowded with tourists. May, June, September, October: Still high season, but with slightly less tourists than July and August. The weather is still good, with a low chance of rainfall. November to April: Rainy season. There is a high chance of rain on any given day, but the upside is that it’s low season. Accommodation is cheaper, and there are fewer tourists. When did I go? I visited in December and the weather was only a minor annoyance — most days were beautiful and sunny! Cusco sits 3,400m (11,150ft) above sea level – so altitude is a serious factor you have to consider! Make sure you factor in time to acclimate. This will vary greatly from person to person. Speaking from personal experience, I don’t have a problem with altitude, and I only get a little out of breath when hiking. Matt on the other hand gets horrible attitude sickness with nausea, headaches, and digestive issues. Your level of fitness has very little to do with it – even professional athletes get altitude sickness. Allow 2-3 days to acclimate, or risk feeling really horrible. Tips for acclimation: STAY HYDRATED! Make sure you drink lots of water as hydration is key to reducing altitude sickness. You can’t drink tap water anywhere in Peru (or throughout most of South America), so I used a Sawyer Water Filter the entire trip and saved hundreds of dollars — not to mention all the plastic bottles! I also love my Platypus water bottle, as it moulds to the shape of my backpack and gets smaller as it empties. Once you’re acclimated to the altitude, Cusco is teeming with sights to explore. Almost all of the below activities are also free! Mercado Central: Beans by the bag full! Free walking tour: Do this on your first day to get acquainted with the area. Almost all of the walking tours leave from Plaza de Armas, with various companies offering them throughout the day. Ask at your hostel for the most up-to-date schedule. Tours are tip-based. Mercado Central de San Pedro (San Pedro Market): Feast your senses on this traditional Peruvian market, crawling with locals, tourists, produce, funky cheese, and more. It’s a great place to buy local produce if you are self-catering, or grab a cheap bite to eat in one of the stalls in the back. I wouldn’t buy souvenirs here, as I doubt any of the “alpaca wool” sweaters have anything but synthetic in them. Plaza de Armas: The main square in Cusco, lined with many churches and views onto the surrounding hills. 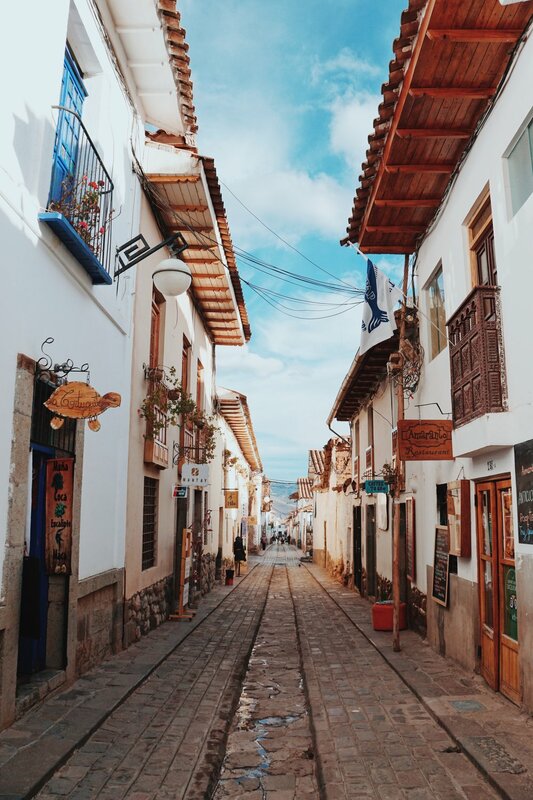 Wander San Blas: San Blas is the bohemian art neighborhood of Cusco, and it’s cute alleys and artisanal shops make it a pleasure to meander by foot. You’ll find yoga studios, hipster coffee shops, and vegan eateries galore. Get lost exploring the old town: Cusco is a fantastic walking city, and when armed with a sturdy pair of shoes you can spend days discovering the delights of the city. Start at the Plaza de Armas and follow your nose, and if you’re looking to buy things come ready to barter! The bohemian neighborhood of San Blas. Come hungry, because Cusco is one of my favorite eating cities in South America. What sets it apart from other cities is the amount of modern cuisine on offer. You can easily find delicious vegan eats alongside traditional digs. Eating out is really affordable, with a generous main meal costing the equivalent of $5 USD. 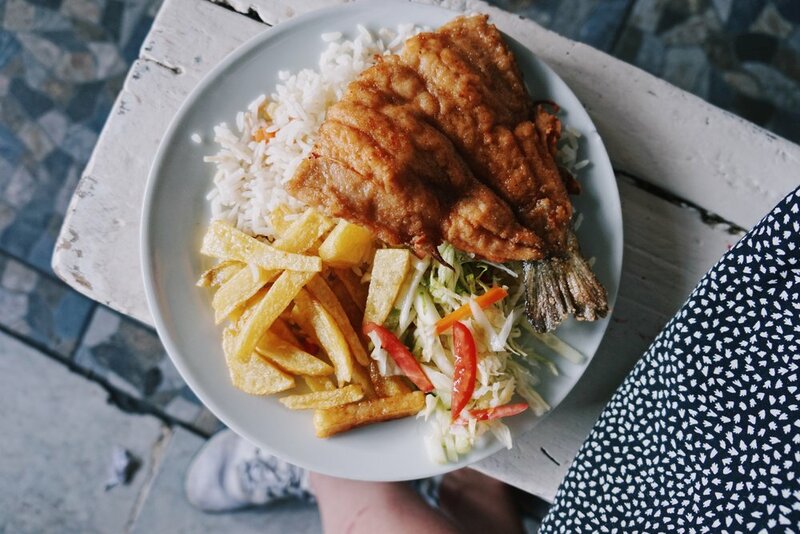 Must-try: Fried “trucha” (trout) at Mercado Central. Green Point Restaurants: The best vegan food in Peru. Go for their set lunch menu, where 15 soles ($5 USD) gets you unlimited salad bar, main course, and dessert. Mercado Central de San Pedro (San Pedro Market): A great place to try traditional Peruvian fare. The trout was a favorite! Tip: Choose to eat at a stall with high turnover, as the food safety standards are lax to say the least. La Bodega 138: Fairly authentic Italian food in a rather fancy setting. Both their pastas and pizzas are top notch, and they have decent craft beer and wine. The best vegan food I ate in Peru: Green Point Restaurants. Maikhana, The Indian Restaurant: If you are in need of a break from Peruvian fare, head here for delicious Indian buffet at lunch. Their garlic naan is some of the best I have ever had! Chia Vegan Restaurant: Great salads and stir-frys. Qura: Hispter coffee in San Blas that also serves tasty acai bowls. Creperia La Bo’M: Over-the-top, decadent crepes. We went with a sweet Nutella, banana, and ice cream combo, but they also have savory options if that’s your thing. Dona-Dony: A hole-in-the-wall restaurant that has a cart out on the street selling doughnut sticks, fried to perfection, and dipped in cinnamon sugar. I ate one every day. Sabores: If you’re in need of a light, cheap meal, this place serves simple yet satisfying “caldo de gallina” (chicken soup). It’s a traditional Peruvian dish you should definitely tick off your list! Limbus Resto Bar: While the drinks are pretty average, the view at sunset is unbeatable. Walking the train tracks to Machu Picchu. The best and most rewarding way to reach Machu Picchu is to hike – and I recommend the Salkantay Trek. I did it for less than $100 (including the admission ticket), you can read all about it here. If you don’t want to hike the whole way there, you can skip the first part of the Salkantay Trek and get a colectivo directly from Cusco to hidroelectrico train station (25 soles). Use the instructions in my Salkantay Trek post for the rest of the trip (skip to “day 2” of Hiking and Transportation Route). This involves staying one night in Aguas Calientes, then taking the colectivo back to Cusco the following day. If you’re looking for another unique adventure to check out in Peru, you have to do the cargo ship to Iquitos! It’s one of the most amazing travel experiences I have ever done. visiting rainbow mountain - is it worth it? I decided not to visit Rainbow Mountain as the weather was overcast and potentially snowing when I was there in December. Snow would cover the “rainbow,” so I decided it wasn’t worth it. I had also seen some amazing mountains on the trip so far, and paying 60 soles for a tour isn’t really my style. My friend did decided to do the tour and she liked it! She used the tour agency located under Maikhana (the Indian restaurant mention above) and paid 60 soles. This was the best value tour she found, and half the price our hostel was quoting. As a rule in Peru, always haggle and double-check what’s included (food, entry fees etc.) — and make sure you get things in writing on your receipt or proof of purchase. We stayed at Magic Packer hostel and really loved it. It’s new, management is knowledgeable and very helpful, and the dorms are spacious and clean. Breakfast of fruit, cereal, bread, and jam is included. There’s a functional kitchen, and they even have an in-house chef who does great theme nights (like barbecue!). Book using our Booking link and receive $25 credit on your next stay. Bed for the night! 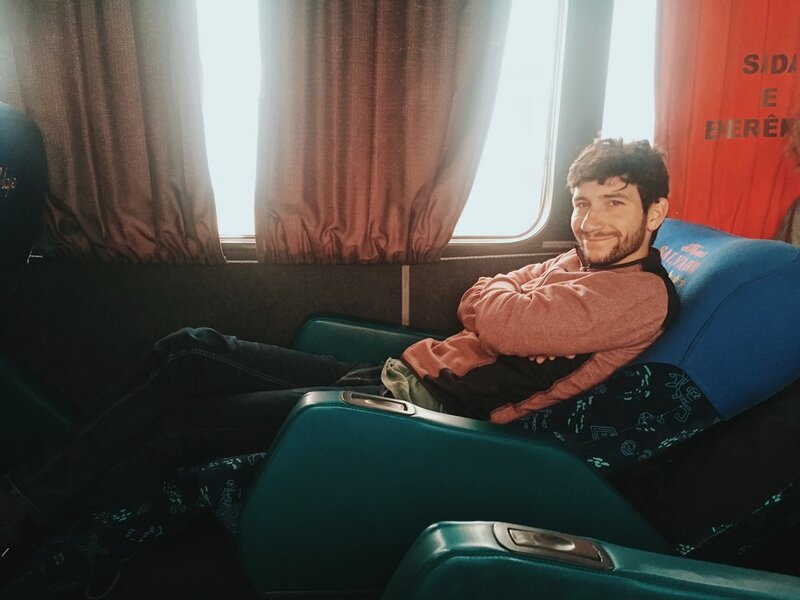 Overnight buses in Peru. Bus: Cusco is linked to all major cities in Peru and some in Bolivia by bus. Most of the buses are overnight, and depending on the quality, can be very comfortable with wide reclining seats. Bus companies can be hit or miss, but generally the more you pay, the more comfortable your ride will be. We had good experiences with the following bus companies: Cruz del Sur, Tepsa, Excluciva, and Movil Bus. We had a particularly bad experience with Econociva – so stay away. To check timetables, RedBus is a useful resource. You can also buy tickets on RedBus, but these will be more expensive than if you buy directly at the bus station, where you can haggle on your fare. Approximate travel times and costs for major routes: Lima (90-100 soles; 20 hours), Arequipa (40-60 soles; 10 hours), Puno (50-60 soles; 7 hours), La Paz (80-100 soles; 15 hours). Plane: If you’re coming straight from Lima, flying is the best option. You can often get reasonable flights on SKY Airlines or Viva Air. Questions on planning your visit to Cusco? Drop us a comment below or say hello @nutritiontraveller. Disclosure: This post contains affiliate links, which help keep Nutrition Traveller running. I personally use every product and app I recommend on here and truly love them! Post updated on September 25, 2018.